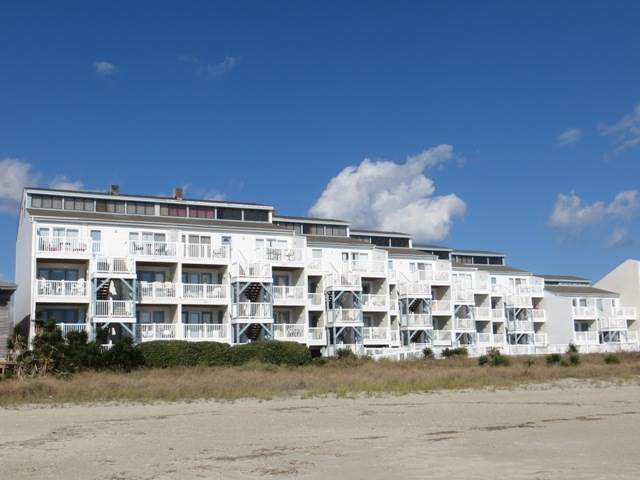 Oceanfront 1 bedroom, 1 bath first floor condo located near the Ocean Cove pool. Ceiling fan in living room. Two televisions, a DVD player, stereo, wireless internet access (May to September ONLY). Well equipped kitchen includes dishwasher, washer/dryer, and microwave. Sundeck with porch furniture, Bar height table and chairs for unobstructed view from private porch. Large pool and whirl pool on expansive deck with outside shower to use when coming in off the beach. Complex is centrally located on the island - within easy walking distance to pier, amusements, restaurants and shops. Community charcoal grill available for your use. This complex is a great location! Non-smoking and no pets allowed. Sleeps 6 Bedding: *Queen* with Jacuzzi tub in bedroom Bunk Nook* in hall, and Queen sleeper sofa in living room area.